I have made this soup many times this winter, it’s easy and delicious, the perfect combination. I may add a bit more curry and top the soup off with toasted cashews or leeks… be creative. • Roast the chopped apples and squash, drizzled with 2 tablespoons of olive oil, in a 400-degree oven for approximately 40 minutes or until they are tender. • Sauté the onions and 2 tbsp of oil in a large heavy pan, cook until clear, then add garlic and cook for another minute. • Add the roasted squash and apples with stock and cook for 5 minutes. Emulsify the soup with an immersion blender. • When smooth add the cream and curry. Add more stock if needed and salt & pepper to taste. Seafood chowder was a request from one of my clients for Christmas Eve dinner. I really have never made my own seafood stock but after talking to my fish expert he said using the shells of the African Lobster tails in the stock would make this recipe magical! It worked… I can’t explain how delicious this recipe is filled with Little Neck Clams and African Lobster meat. I took the basic recipe from Ina Garten’s Lobster Chowder and added clams, you could also add shrimp, halibut, whatever you love in a seafood chowder. • Remove the meat from the shells of the lobsters. • Cut the meat into large cubes and place them in a bowl. Cover with plastic wrap and refrigerate. Reserve the shells and all the juices that collect. • Cut the corn kernels from the cobs and set aside, reserving the cobs separately. • For the stock, melt the butter in a stockpot or Dutch oven large enough to hold all the lobster shells and corncobs. • Add the onion and cook over medium-low heat for 7 minutes, until translucent but not browned, stirring occasionally. • Add the sherry and paprika and cook for 1 minute. • Meanwhile, in another stockpot or Dutch oven, heat the oil and cook the bacon for 4 to 5 minutes over medium-low heat, until browned and crisp. Remove with a slotted spoon and reserve. • Add the potatoes, onions, celery, corn kernels, salt, and pepper to the same pot and sauté for 5 minutes. • When the stock is ready, remove the largest pieces of lobster shell and the corn cobs with tongs and discard. • Place a strainer over the soup pot and carefully pour the stock into the pot with the potatoes and corn. • Simmer over low heat for 15 minutes, until the potatoes are tender. • Add the cooked lobster, the chives and the sherry and season to taste. • Heat gently and serve hot with a garnish of crisp bacon. This is a great one pot meal for winter entertaining. You’ll want to reheat the leftovers as the next day it’s even better. • Peel the onions and cut off the ends. • Next heat the 2 tablespoons of the oil in a large, heavy pot or casserole over medium-high heat (I use an 8 quart iron pot). • Sprinkle the veal with salt and pepper. Toss the veal with the flour in a large bowl to coat. • Working in 3 batches, add the veal to the pot and cook until browned, adding another tablespoon of oil as needed, about 10 minutes per batch. • Using a slotted spoon, transfer the browned veal to a bowl. • Add the garlic and thyme to the same pot and saute over medium heat until tender, about 30 secords. • Next add the wine and simmer over medium-high heat until reduced by half, stirring to scrape up the browned bits on the bottom of the pot, about 5 minutes. Return the veal to the pot. • Stir in the broth and tomatoes with their juice. Cover partially and simmer over medium-low heat for 15 minutes. 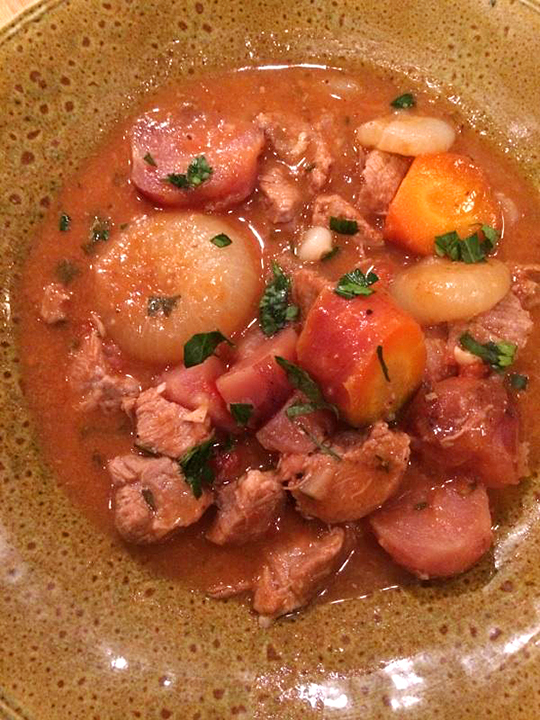 • Add the onions, potatoes, turnips, and carrots to the stew and simmer uncovered until the veal and vegetables are tender and the juices are thick, stirring occasionally, about 45 minutes. • Stir in the parsley. Season the stew to taste with salt and pepper. 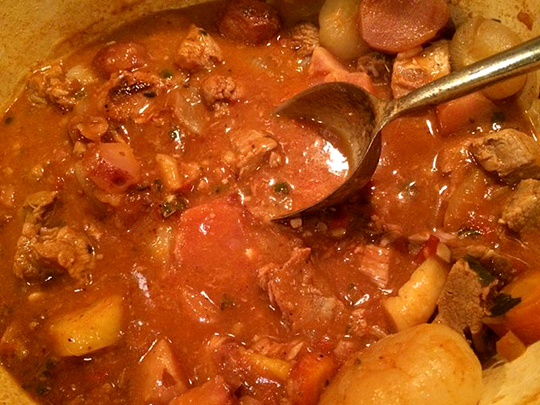 The stew is ready to serve. Enjoy! This is a great meal in itself. I serve it with chopped cilantro, homemade tortilla strips, and a good Mexican beer. The recipe is from “The Family Chef” by Jewels & Jill Elmore. • Prepare the meatball mixture: In a hot skillet add the oil and then sauté the onions, shallot, mushrooms, thyme, salt, and pepper until mushrooms are cooked through and liquid is absorbed. • Add the garlic and parsley. Remove from heat and let cool. • Add all the sautéed ingredients to the meat, season again generously with salt and pepper and mix together lightly by hand. Be careful not to over mix, which can toughen the meat. • If you have time, let the meat rest for a few minutes before forming into 1” meatballs. • In a large-bottomed pot, brown the meatballs in olive oil, turning frequently. Set aside. • Prepare the soup: In the pan you used to brown the meatballs, add a touch more oil and sauté the chopped onion and celery until soft and translucent, scraping the bits from the pan to incorporate the flavors. • Add the fresh tomatoes and the chicken stock, oregano, and cilantro to pot. Bring to a boil. • Turn down the heat to medium and simmer for at least 15 minutes or so. • Add the meatballs to the pot. Simmer until meatballs are cooked through (about 10 more minutes). This soup gets even better the next day! This recipe is a meal in itself, but it can also be an excellent starter for a special dinner. There are so many versions of this recipe but I really like Giada’s in her “Giada’s Family Dinners” cookbook. When you serve this keep a copy of the recipes… you will be asked. Using homemade chicken broth really makes a difference. This is a great soup to drop off for a sick friend! Enjoy! • In a large bowl, stir together the onion, parsley, egg, garlic, salt, and pepper. • Stir in the cheese and bread crumbs. Using your hands, mix in the ground beef and pork. • Shape the mixture into 1-inch meatballs, making approximately 75 balls. Place on a baking sheet. • Bring the broth to a boil in a large pot over medium-high heat. • Add the meatballs and escarole and simmer until the meatballs are cooked through and the escarole is tender, about 10 minutes. • In a medium bowl, whisk together the eggs and cheese. • Add the egg mixture to the soup slowly, stirring with a fork to form thin strands or egg, about 1 minute. • Season the soup to taste with salt and pepper. • Ladle the soup into bowls and serve. When I think of tomato soup it brings back memories of a can of Campbell’s with a processed grilled cheese sandwich, a comfort food from my past. I didn’t know soup could get better than Campbells! I’m telling you this soup is a must try. It is smooth, comforting, and delicious; a creamy tomato base with a hint of saffron and a bit of body added by the orzo. Make an adult grilled cheese with Gruyere or an aged cheddar and a thick crusty bread to accompany it. My family and clients keep asking me to make this soup. Some grilled cheese croutons thrown in also make it special. • Heat oil in a large pan or Dutch oven over medium heat add onions and sauté for 15 minutes over med low heat till golden brown. • Add the garlic and cook for another minute. • Now stir in the chicken stock, tomatoes, saffron, 1 tablespoon of salt, and 1 teaspoon of pepper. • Bring soup to a boil then lower the heat and simmer for 15 minutes. • While waiting, boil the Orzo in a medium saucepan, use salt in your water. Once water is boiling add orzo and cook for 7 minutes, the Orzo will finish cooking in the soup. Drain and add to the soup. • Now add the cream 7 let soup simmer for about 10 more minutes, continue to stir. • Serve with grilled cheese croutons…use Gruyere cheese or cheddar! Enjoy! This is a recipe by Ina Garten… weekend cooking! I am not a fan of sweet potatoes so I shy away from recipes with this vegetable… but this soup is beyond delicious. It is a recipe from “Stonewall Kitchens” and I find all their recipes are proven winners. I made it with fresh corn and peppers from the farmer’s market. The aroma and flavor of the saffron cream finishes this soup to perfection. It is a must try for the cold nights ahead, let me know if you enjoy it. It can be served as a first course, for lunch, and don’t forget to include a crusty bread, homemade cheddar biscuit or oyster crackers. • In a large pot, heat the oil over low heat. Add the onion and cook, stirring occasionally, for 10 minutes. • Add half of the red pepper and all of the yellow pepper and cook, stirring, for 2 minutes. • Add the sweet potato, season with salt and pepper, and cook for 8 minutes, stirring occasionally. • Stir in the flour and cook for 2 minutes. Raise the heat to high, stir in the broth, and bring to a boil. • Reduce the heat to low, cover, and cook for about 12 minutes until the potatoes are just tender. • Meanwhile, if using fresh corn, shuck it and remove the silks. Using a sharp knife remove the kernels from the cob by standing each cob on one end of the cutting board and working the knife straight down the cob; you should have about 3 cups of kernels. Mix in the kernels; set aside. • In a small saucepan, heat the cream and saffron over low heat for about 5 minutes, until just simmering. • Add the saffron cream to the chowder and stir in the corn. Heat over low heat for 5 minutes. • Taste for seasoning. Serve piping hot, topped with the scallions, and the remaining red pepper.